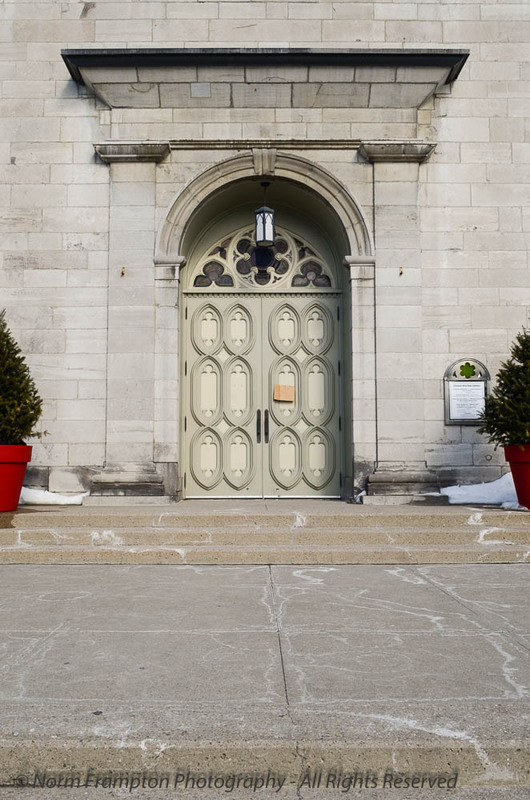 Gallery | This entry was posted in Photography, Thursday Doors and tagged Architecture, Canada, Church, Doors, Historic Buildings, Ontario, Ottawa. Bookmark the permalink. Norm, I am finally going to join the party. I won’t be a weekly contributor, but more sporadic. I need some hand holding. I will add #ThursdayDoors on Twitter. I have copied the blue froggie image to my first Doors post (I hope that works). Which tag should I be using? Thanks – I have to say that looking at your pictures and those of others in this group have inspired me to look at my surroundings in a new way. I love it! Basically you create your post and schedule it to publish anytime between Thursday and Saturday. No need to copy the blue froggie. And voila, your post gets added to the list of contributors. Thanks. I’ve read through the rules. I’ll be especially careful not to break any laws! I also try to watch where I’m stepping and in what I am stepping while snapping pics. I’ll do my very best with the blue frog button do-dah – that’s the only bit that doesn’t seem 100% clear. I’m sure, once I try, it’ll be easy peasy. Thanks for the invite to the party. the snow has gone, =^_^= thanks for taking some great photos, saves me a trip downtown and trying to find parking..
We’re looking forward to going back for the Tulip festival in May. Have a great week-end, Norm! Thanks Marianne – I did some research and found that there are versions of this sculpture on display in a number of major cities. I really liked the door with the address 143 on the side of this, Norm. 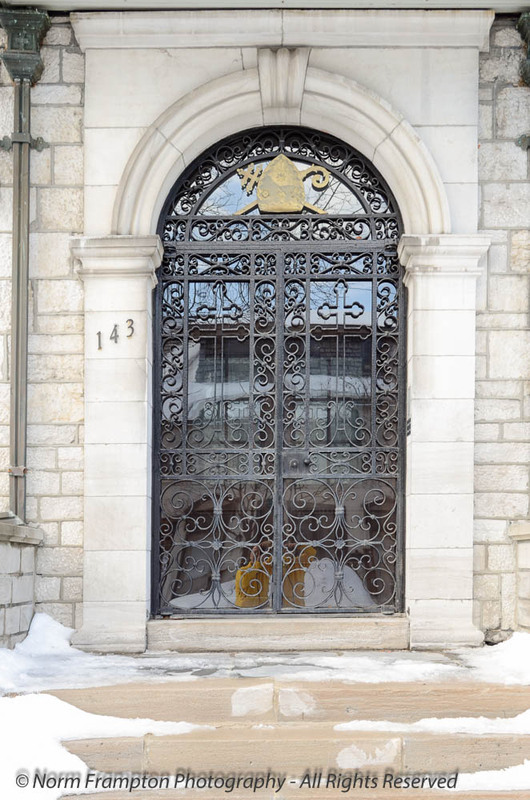 I liked the intricately designed metal door covering/gate, Norm. 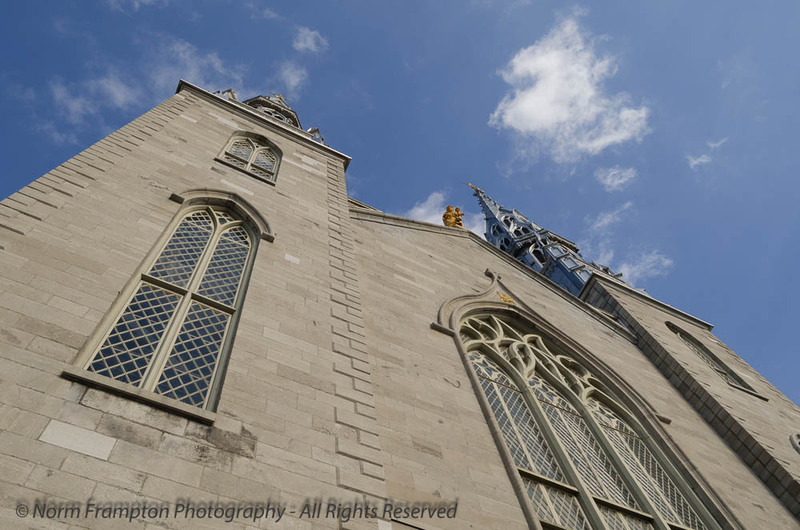 You have captured many doors around the Notre Dame Basilica. The awesome display of tall ceiling in a deep blue with the beautiful interior took my breath away! That spider would give me nightmares!! Lovely shots, as usual. Awesome architecture in the first, since there’s so much glass! But the spider sculpture is definitely not my favorite .Loved the Gothic period in art history, maybe because many of the church buildings in Holland (my country of origin) are of this period and I’ve been to actual services, and also sang there, so a lot of good childhood memories. The cast iron door is beautiful!! What is the men’s curling championship about? Those little vestibules sticking out just slay me. I love them SO MUCH. No Hugh, a red line through a P means no parking here as it does in most places. 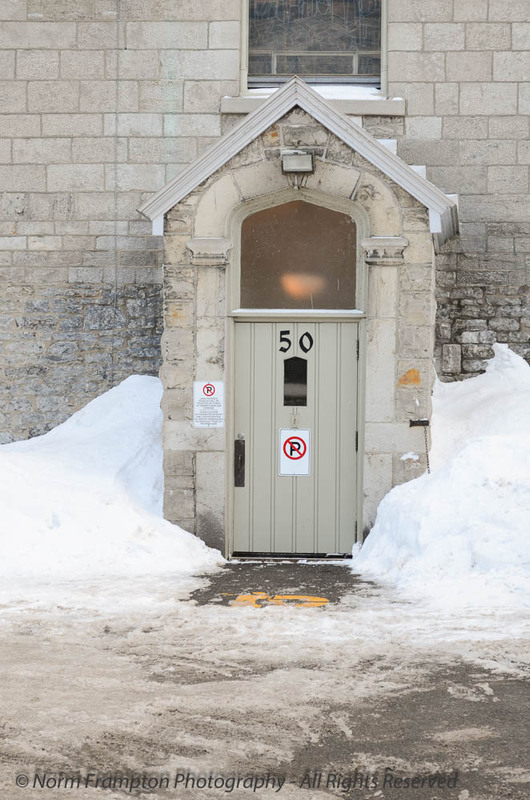 You will find that most of our signs resort to pictograms though to be easily understandable in both official languages. Thanks, Norm. Enjoy the rest of your weekend. 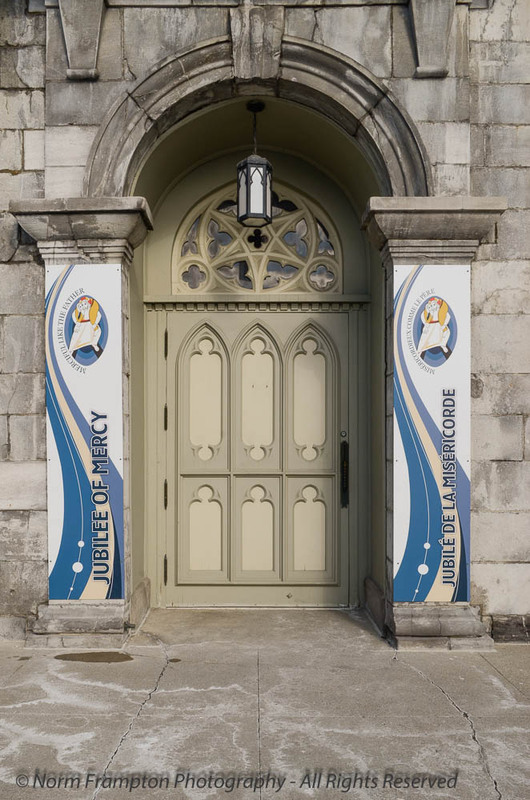 Pingback: Thursday doors….. – Third Time Lucky! Norm, I haven’t been in to this church in Ottawa. I may have to check it out next time I am there! 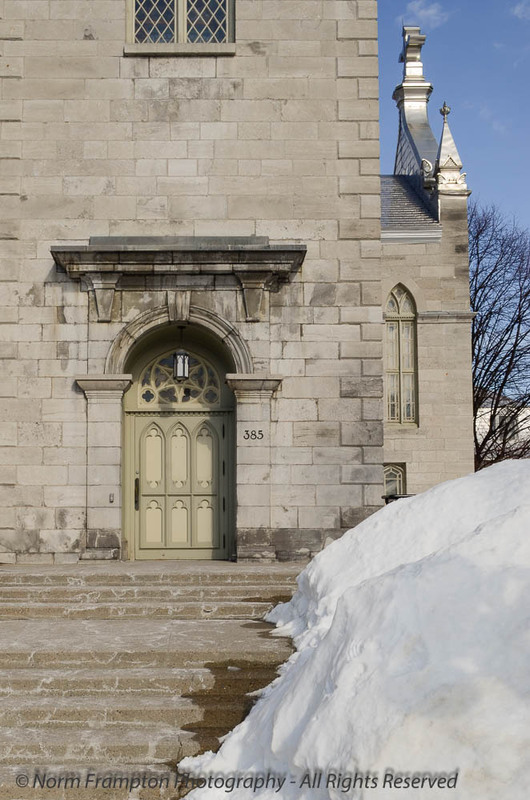 It’s definitely worth adding to the itinerary if you have time – the inside is something to see. The doors are lovely. 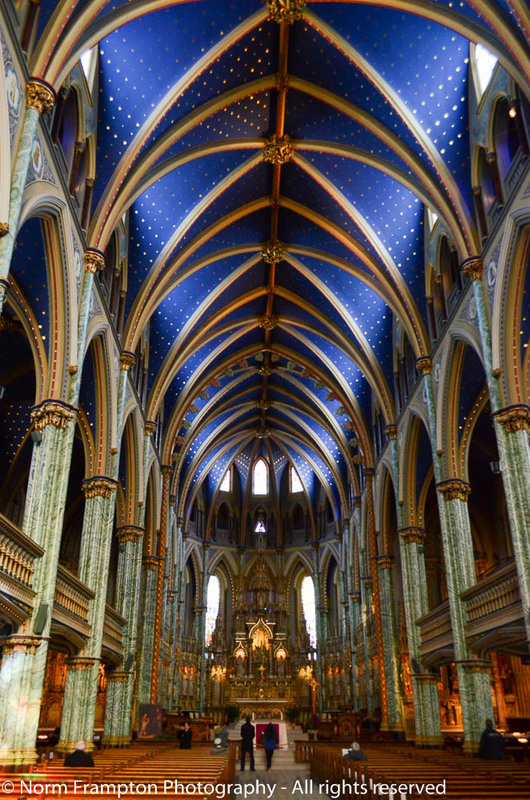 Especially that one with all the iron work, but the blue ceiling! OH, it’s gorgeous! I don’t get the giant spider though? The spider is outside the entrance to the museum. It’s by French artist Louise Bourgeois. I always look forward to the leader of the pack’s doors and no disappointment here! Stunning! Magnificent building, Norm, inside and out. But that giant spider……. or was it on my laptop screen – yikes. Wow! Now those are all very grand and impressive doors. What a building! Thanks. It really was impressive. The interior is so ornate it’s almost over-the-top in its opulence. I find that I am drawn to ornate architecture. However, I get the over-the-top statement. In Baghdad, I saw a few castles, mansions or whatever they official were. Though beautiful they bordered on gaudy. For my own home, I like simple and elegant lines. Churches never fail to deliver spectacular architecture and this one is another beauty. 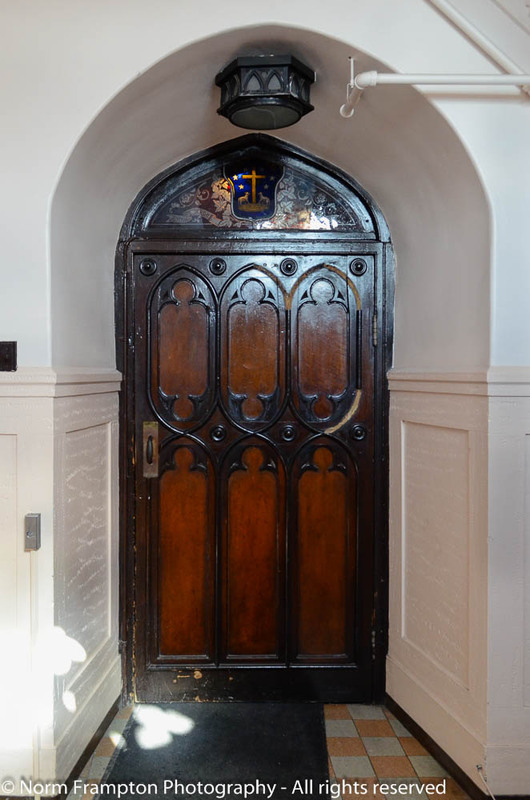 The wrought iron gate door and the wood interior door are my favourites. What a treat Norm! I love the doors, and the variations on that common theme. The natural wood ones look so different from the painted ones. The ironwork is also a favorite shot for me. The interior is amazing. I’m glad you took us inside, but I’m glad you had time and a what seems like a beautiful day to get some shots from outside. Thanks Dan. Yes it was a beautiful day. 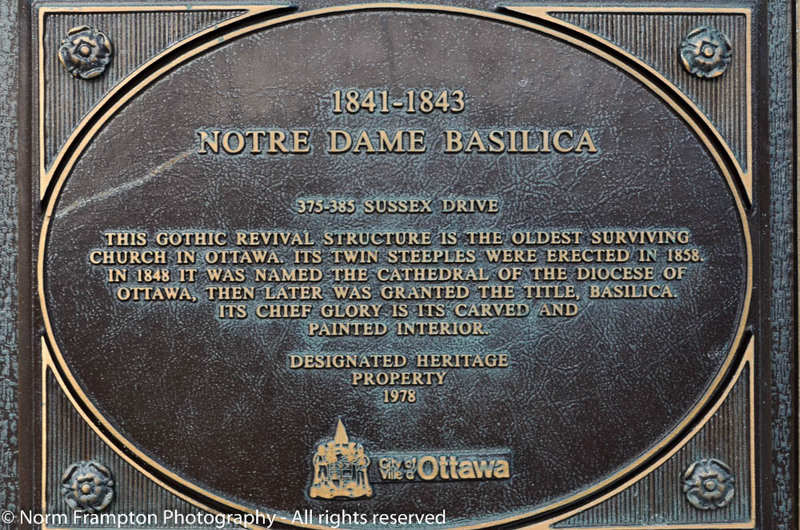 Unfortunately I had pretty much emptied my tank with all the walking I did in the museum beforehand, otherwise I would have stayed out longer and roamed the streets in what is a very interesting part of Ottawa. I`m already looking forward to going back in May for the Tulip festival. I’m looking forward to those photos Norm. The color of the doors doesn’t stand out, as with the red doors so many of us love, but they’re still beautiful and the detail is wonderful. I also like the metal gate and the wooden interior door. And the inside? Stunning! Good morning Norm, these are wonderful! Love the angle on the last one, very dramatic! Thanks Josée – I’m addicted to my wide angle lens for shots like that. I wonder if it is by the same person? Norm I managed to muck up my link again! if you have the time could you please fix it! sorry! Thanks Leanne. 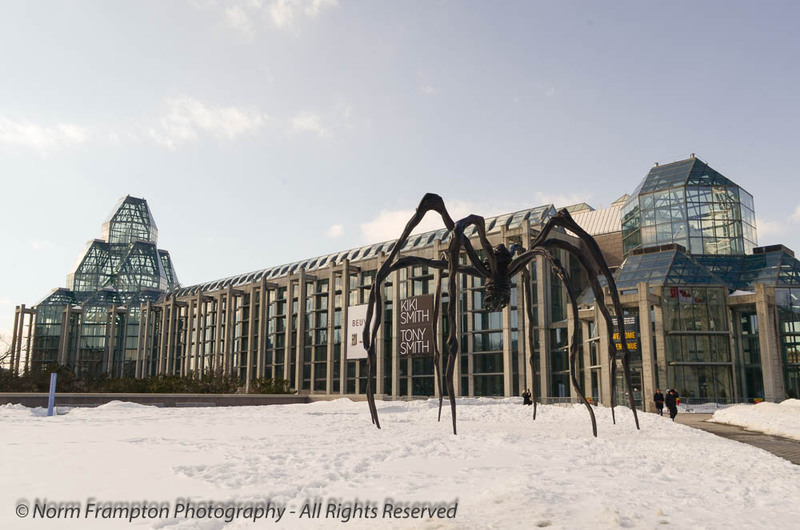 Yes it is indeed a Louise Bourgeois sculpture called “Maman” – the spider is carrying marble eggs under its belly. Apparently there are versions of this sculpture in several major cities around the world. The one in Roppongi is a maman too! 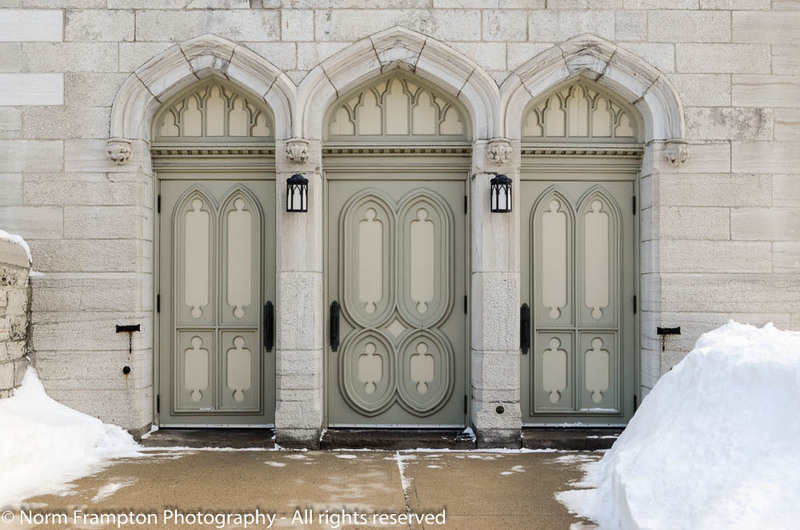 I like the beautiful design of the doors of these church. 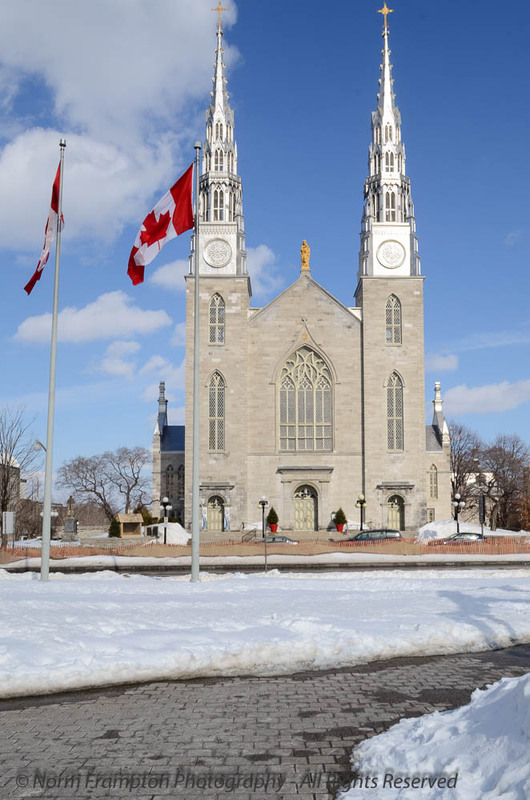 I love your Cathedral photos, specially the ones with heaps of snow on sides. very nice doors and the interior is magnificent.